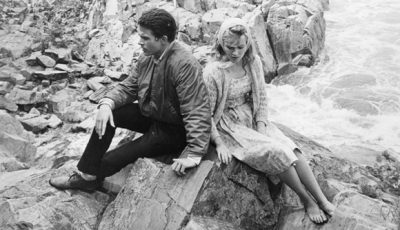 Back at the start of the 1960s, when an English Literature classic from the 1800s was given a 20th Century makeover by one of cinema’s true do-it-yourself showmen*, the results weren’t as stunning as one might have expected. Mark Fraser ponders the reasons why. 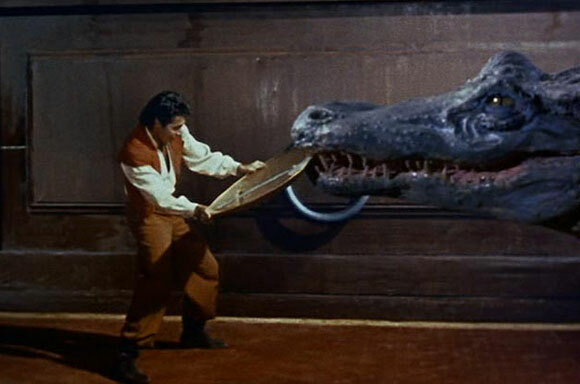 For those who usually enjoy Ray Harryhausen’s stop-motion animation, Jack Sher’s The 3 Worlds of Gulliver (1960) may be something of a disappointment given most of the late maestro’s special effects used in the movie involve travelling mattes and perspective photography rather than his trademark clay animated creatures. 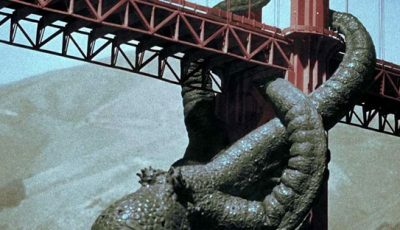 Given this, it is arguable that the film really only comes to life a handful of moments throughout its 100 minute running time, with the most notable one perhaps being when Dr Lemuel Gulliver (Kerwin Mathews) is forced to fight a fast-footed baby crocodile during his visit to a land of giants. Of course this is not to suggest the movie doesn’t bombard its audience with screen trickery (which is not surprising given the subject matter); nor is it a particularly slack work, integrating the above-mentioned special effects with some wonderfully detailed miniature sets (by Derek Barrington and Gil Parrondo), a number of suitably theatrical costumes (designed by Eleanor Abbey) as well as the entertaining use of models and props (Harryhausen and Francisco Prosper). Nevertheless The 3 Worlds of Gulliver is essentially a kiddie flick – a fairy tale containing an articulately watered down version of an astute political allegory written by a guy who is described by the 1971 edition of Encyclopaedia Britannica as “the foremost prose satirist in the English language, and one of the great satiric masters of all time”. While some members of the collective modern audience – whose movie-going sensibilities have been spoilt by the breath-taking computer-generated images which now dominate fantasy cinema – may not marvel at the archaic technical wizardry of this Harryhausen/Sher collaboration, they should at least appreciate the effort that went into the making of this rather quaintly-told yarn. Based on the novel Gulliver’s Travels by Irish church dean/polemicist/author Jonathan Swift (1667-1745), the movie visits only two of the several strange foreign destinations depicted in the original 1725 story – that being Lilliput and Brobdingnag. As anyone familiar with the book would already know, Lilliput is an island nation in which no one within the populace is taller than six inches high; a place where Gulliver – after being washed off a merchant ship by a storm during his maiden sea voyage – finds himself a giant amongst his new peers, who view him with a mixture of fascination, wariness and, later, exploitative potential as they persuade him to assist them with their war effort against the neighbouring state of Blefuscu. From the outset, Mathews, as Gulliver, is as nice as they come – a caring and compassionate (albeit impoverished) medical practitioner who at first promises the Lilliputians “a land without greed or envy; a land of love where no man has an enemy” before chiding them like a patronising primary school teacher for their constant internal bickering and aggressive foreign policy agenda. It’s during the Lilliput episode – the second world of the titular character – that Harryhausen’s travelling matte work comes to the fore as it quickly (and, in an old fashioned sense, effectively) establishes the physical difference in height between the visitor and the tiny locals. With the help of models and undersized props, Gulliver rips up trees and replants them to create farmland (essentially so more food can be produced to feed him), catches a healthy bunch of fish with his hat, tries spitting out a castle fire with a mouthful of red wine, rips out the iron-barred window of a prison tower during a jail break and steals Blefuscu’s shipping fleet while it’s anchored in harbour. Although there is enough visual fodder here to keep most junior filmgoers amused, this episode also has its fair share of excessive chit chat – particularly when the oversized protagonist tries to reason with Lilliput’s autocratic king (Basil Sydney) and the members of his royal court over their peculiar sense of protocol. 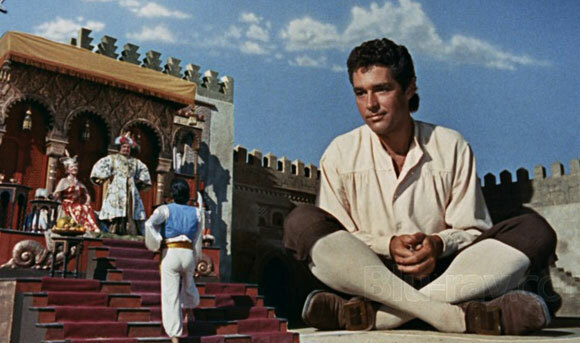 Given The 3 Worlds of Gulliver is essentially aimed at children, though, one can’t blame Sher and Arthur Ross (who together wrote the screenplay) for spelling out simplified political truths in order to maintain the attention of their young audience. Further on in the narrative, when Gulliver and his fiancé Elizabeth (June Thorburn) end up as captives of the giant couple King Brob of Brobdingnag (Gregoire Aslan) and his wife (Mary Ellis), the enterprising doctor is pitted against the above-mentioned baby croc after being accused of witchery – a scene which provides the movie with one of its true worth-the-cost-of-admission moments. Indeed, the apparent savagery of the infant beast – with its snapping jaw, sharp teeth, swishing tail and hungry leer – is so daunting that it sits in stark contrast to the other main dangerous non-human creature depicted in the story, that being a giant squirrel, which seems almost playful by comparison. 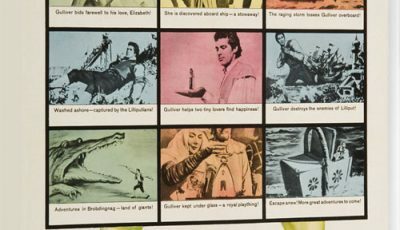 While this section of The 3 Worlds of Gulliver also boasts some impressive travelling matte work, it contains a few of the film’s most interesting sets, with one stand out being the castle laboratory of court alchemist Makovan (Charles Lloyd Pack), which looks like it could have been designed and lit (by cameraman Wilkie Cooper) for a Hammer horror production. 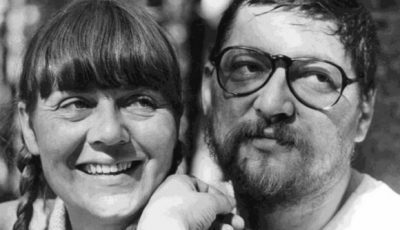 As for the melodrama that takes place in the land of the giants, it too is aimed at the kiddies – particularly when it includes the 40-foot tall Glumdalclitch (Sherry Alberoni), the sweet-as-honey peasant girl who inadvertently (and literally) hands Gulliver and Elizabeth over to closet sadist King Brob, but ends up redeeming her innocent self by helping the couple escape. Harryhausen once said he did not believe a computer had been devised which could “create the complicated movements necessary” for his style of animation (Philip Strick, The Movie, 1981, p 2000). 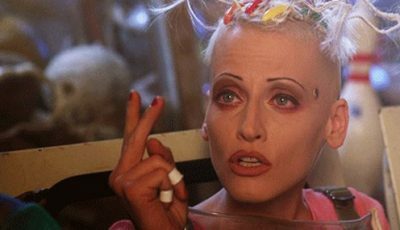 While it’s arguable the software to do this now exists, there’s no denying his special effects have, to this day, maintained their distinctive look – even when they seem to be merely reflecting the state of contemporary cinematic technology at the time they were employed. The baby crocodile battle in The 3 Worlds of Gulliver, while not as elaborate as the fighting skeletons in Don Chaffey’s 1963 Jason and the Argonauts or the rampant dinosaur in James O’Connolly’s The Valley of the Gwangi (1969), is still a minor achievement. It’s a lively animated moment thrown into the retelling of a classic story which, in all fairness, needs the lift. *A term stolen from British film critic Philip Strick. 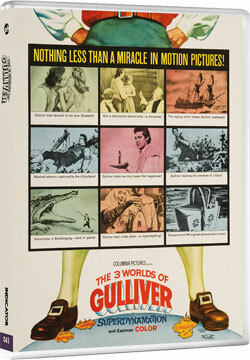 Top 10 Films reviewed The 3 World’s of Gulliver on Blu-ray courtesy of Powerhouse Films. The film was released as part of the THE WONDERFUL WORLDS OF RAY HARRYHAUSEN, VOLUME ONE: 1955-1960 limited edition Blu-ray box set on Sep 27, 2017 and features alongside IT CAME FROM BENEATH THE SEA (Robert Gordon, 1955) & 20 MILLION MILES TO EARTH (Nathan Juran, 1957). Find out more about the release here. I wouldn’t say I’m a Harryhausen fan by any means but I do have a soft spot for Jason and the Argonauts and Clash of the Titans. 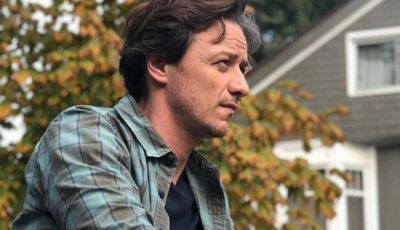 That said, there’s always an element of fascination watching his work because I’m constantly reminded of the painstaking attention to detail in the effects work. It stands up today perhaps more as a piece of nostalgia but it’s great to go back and re-watch these. I haven’t seen 3 Worlds in years so I might pick up this box set.